Having failed at its assigned mission of history preservation and education, as evidenced by the Marley Center Museum, the AHS is attempting to redefine itself in peculiar ways. It is trying to resuscitate its 5C Arizona Centennial Museum failure by redefining it as a museum of the future, and is now promoting the new 5Cs of Arizona’s future. It has also renamed it the Arizona Experience Museum, finally acknowledging the fact that it will never be open for Arizona’s centennial. Arizona minerals are the backbone of the Arizona Experience. Arizona Mineral Education provides links to mineral museums, photo galleries, and education outreach programs. It is a resource for educators, students, and the Arizona public (italics added). How does the AHS plan to ever justify that self-exalted status with only the little 500 square foot mineral display their contractor has planned for the Arizona Experience Museum? The Arizona Legislature needs to review what is happening here. If they approve, then they need to revise the Arizona Statutes to redefine the AHS mission. If they do not, then they need to cease funding unauthorized activities. Is the Arizona Historical Society embarrassing the Arizona Centennial Commission? The Arizona Centennial Commission’s website (www.az100years.org/) refers to the Arizona Historical Society’s Arizona Centennial Museum as their “number one signature project” and the “centerpiece” of Arizona’s centennial celebration. Yet, when interviewed by the media, the director of the centennial commission says hardly a word about the centennial museum. Does the Centennial Commission secretly fear that the centennial museum will be yet another AHS failure, like the History Museum at Rio Nuevo (Tucson) and the Marley Center Museum at Papago Park (Tempe)? Are they afraid this failure will be especially embarrassing because it eliminated the top rated Arizona Mining and Mineral Museum and its K-12 science education program for no good reason? Arizona Historical Advisory Commission Chair Dora Vasquez and Arizona Centennial Commission Director Karen Churchard say response to statehood centennial plans has been most positive. On Arizona’s 99th birthday, we’ll take a look at plans to celebrate its 100th as the Countdown to Arizona’s Centennial begins. Guests include Karen Churchard, Director of the Arizona Centennial Commission, and Catherine May, Vice President of the Arizona Historic Advisory Council. Is the Arizona Historical Society confused? Woosley said the main focus continues to involve the Arizona Experience (Centennial museum). It is a very forward looking project that starts with the Five Cs but quickly moves into featuring the Arizona we want for the future. Woosley noted that AHS must be patient over the next 12-18 months because this project is moving outside the usual processes and is directed by the Governor’s office, Centennial Foundation, and Arizona Department of Administration. Meetings with the architects and designers are held twice a month. Fundraising is very active and to date $10 million has been raised toward a fundraising goal of $30 million. She stated that what was the Mining & Mineral Museum, would close June 1 and the architectural work on the facility would begin October 1. Woosley commented that there are some highly vocal individuals who do not wish the Mining & Mineral Museum to close and are broadcasting misinformation and aspersions against the Governor, agency and herself. Staff and volunteers in the museum encourage the public to contact the Governor and Secretary of State to voice their grievances. A protest march that some Mining & Mineral volunteers and staff organized is planned for March 15. A little over a year ago, Gov. Jan Brewer announced that her "birthday present" to Arizona for its 100th anniversary in 2012 would be to transform the Arizona Mining and Mineral Museum into the Arizona Centennial Museum. The new museum would focus on all of the Five C's: copper, cotton, cattle, citrus and climate. But making that happen is proving challenging. Fundraising has been slow, and millions of dollars are still needed. Construction is behind schedule; the museum is now slated to reopen in November 2012. The name has been changed to the Arizona Experience Museum, and a group of supporters of the mining museum are fighting the plan every step of the way. The mining museum will close June 1 and Karen Churchard, director of the Arizona Centennial 2012 Foundation, said renovations will likely begin this fall. The non-profit Arizona Centennial 2012 Foundation is overseeing fundraising. Churchard said they have raised $1.75 million of the needed $15.5 million. "We are behind, but we're making up time," she said. "If you call me in another six weeks, I'm hoping I can tell you that our number has at least doubled." There appear to be some serious contradictions. Is the Arizona Centennial Museum a $30 million project or a $15.5 million project? As of March, had $10 million been raised for the museum or only $1.75 million? Did anyone call Churchard six weeks later? Or, anytime since? Has another dime for the Arizona Centennial (Experience) Museum been raised since March? Update: What’s happening to the Arizona Mining and Mineral Museum? The status of the mineral museum can be summarized very succinctly as of July, 2011. The Arizona Historical Society is destroying it. The AHS is defying Arizona law which states that the mineral museum shall be preserved within the Arizona Centennial Museum building. The mineral collection is being scattered across the state, and the AHS may be tossing the remainder of the mineral museum into dumpsters currently located behind the building. Even the large, historic mining equipment outside the building may be threatened. AHS centennial museum plans show it removed, and they will not answer questions about what will happen to it. This raises suspicion that it will be scrapped, because that will be the cheapest way to remove it. According to AHS plans, all that will remain is a little 500 square foot mineral gallery on the west end of the second floor. The historic and top rated mineral museum is being destroyed even though the $15 million Arizona Centennial Museum is not funded. Arizona will probably lose the historic and self-supporting mineral museum with its K-12 science education programs and have nothing but the shell of an empty building in its place. The blog Mineral Museum Madness will continue to document the illegal AHS activity. This blog has now been documenting the destruction of the mineral museum for over a year with 155 posts. For those lacking the time or inclination to read all the detail, a series of “updates” are included. Simply reading the updates will familiarize the reader with the unfortunate story. Prior updates were posted on March 27th, January 6th, and October 9th. The original post on June 5th, 2010 summarized how the misguided centennial museum law came into being. The folly of the Arizona Historical Society’s Marley Center Museum at Papago Park has been well documented by the news media and by Arizona Auditor General Reports. At a cost of about $30 million, it has proven to be of little use to the community. The interactive museum displays tucked away on the second floor are now rotting and rusting in a state of disrepair. There are so few visitors, the gift shop closed. The library is also closed. The prominently placed cocktail bar appears to be used, but poses a question. Why should Arizona taxpayers subsidize private wedding parties? Though it has very limited value to the community, taxpayers are going to pay for it twice. The Marley was included in a bundle of state properties financed by a $300 million Series 2010B Certificate of Participation issued by the U.S. Bank National Association, Morgan Stanley, and others in 2010. Taxpayers were just about from under the initial 20 year mortgage on the Marley, when the Arizona legislature saddled them with another 20 year mortgage (technically a lease purchase) on the very same building. This amounts to taxpayer abuse in the midst of a financial crisis. The Marley is a nonessential state property and should have been sold. If someone had given the state just one dollar for the property, taxpayers would have been far better off. History scrapped for Arizona’s centennial? Arizona Copper Company’s baby gauge steam locomotive number 2 stands in front of the closed Arizona Mining and Mineral Museum. As shown in the photo, it was a favorite with the tens of thousands of children that visited the museum each year. 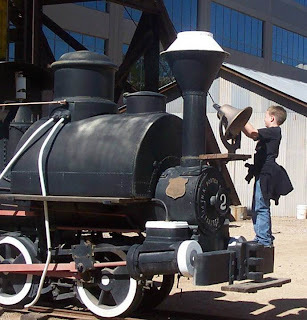 Plans for the Arizona Centennial Museum consistently show that the locomotive and other historic mining equipment will be removed from the property. For over a year, the Arizona Historical Society has refused to answer questions about what will happen to the locomotive. 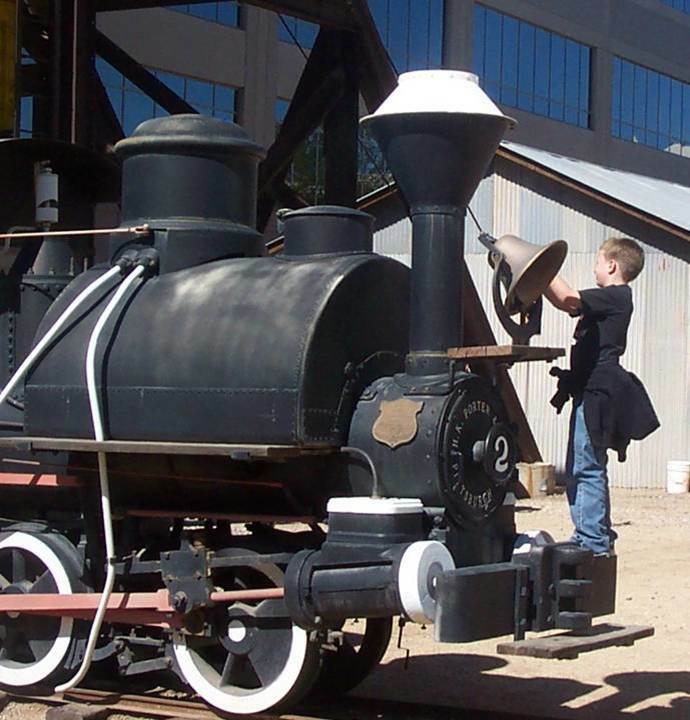 The baby gauge locomotive is one of only twenty nine surviving steam locomotives in Arizona. However, it is much more historic than that. The little locomotive's sister engine (Number 1 and known as Little Emma) was shipped overland from Santa Fe, NM to Morenci, AZ in 1880. It was the first steam engine on the first railroad in Arizona. Before little Emma arrived, mules towed the ore cars on the 20 inch narrow gauge railroad. Little Emma was cut up a century ago for parts to build and acid plant. Does that make Number 2 the oldest steam locomotive in Arizona? Does the Arizona Historical Society intend to scrap it? Arizona Historical Society attempting to hide failure? The AHS is a state agency and depends on taxpayer support for most of its budget. Each year, the Arizona Joint Legislative Budget Committee includes perfromance measures in its budget summary. In the past, that has included museum attendance and customer satisfaction ratings. The chart below shows statewide AHS museum attendance based on data contained in the FY 2010 and FY 2011 JLBC budget summaries. Clearly, there is a problem. Even though the AHS continues to be heavily subsidized, attendance at AHS museums is in serious decline. For FY2010, their subsidy therefore reached a whopping $123 per museum visitor. Anyone who reviews the history, layout, and condition of the Marley Center Museum in Papago Park can easily understand why. The AHS does not appear to be seriously interested in its mission. Rather, it is focused on attracting speical events, such as weddings, to supplement its budget. What is the AHS response to declining museum attendance? Refocus on its mission? Repair the many broken interactive displays in the Marley and reopen the library? Add new, changing displays about Arizona history? The AHS appears to be fudging the numbers provided to the JLBC for the performance review. The review section of the FY2011 JLBC budget summary no longer reports museum attendance. Instead, it reports 100,000 “museum visitors and researchers” for FY2010. It shows 145,000 expected for FY 2011 and 200,000 for FY2012. Researchers. Who are these people and what are they doing? How can there be a growing number of researchers in a closed library? How long does the AHS really think it can hide steadily declining museum attendance by lumping the numbers with undocumented “researchers”?